This article first appeared in Enterprise, The Edge Malaysia Weekly, on April 9, 2018 - April 15, 2018. Vimi Rajgopal, founder and CEO of Interiorati, was living the typical expatriate life, moving from place to place, sometimes working, sometimes just taking in the sights and experiences. “I have lived all over the world. That is the life we led. Every four or five years, we moved from one country to another. We landed in Malaysia five years ago and I have loved it here,” she says. Although Vimi was a qualified textile designer, she took up jobs in the banking sector. And as one banking job led to another, she seemed to move further and further away from what she was most passionate about. In Malaysia, however, Vimi returned to her roots. And when she really thought about it, she realised that what made her feel alive was design — all kinds of design. She was thrilled about beautifully designed spaces, unique handcrafted furniture and the warmth and expansiveness of mood lighting. She also realised that what she really wanted to do was create a platform to bring interior designers together. The idea percolated in her head as she saw designs she liked but never did anything about it, mostly because she had no idea how to. Then, a friend suggested that she join a co-working space and immerse herself in the creative energy of other start-ups. “My friend suggested that I check out Common Ground as it is a great place for start-ups,” says Vimi. When she visited the place, it clicked immediately. “I loved the vibe and decided to move in. At Common Ground, I met a company that builds websites. We had a couple of meetings and I decided to go ahead with them as we were both based out of the same office. It made communicating with them easy and translated into a great work relationship,” she says. It took Vimi about five to six months to get the platform, which she named Interiorati, going. When Enterprise met up with her, the business had only been operational for a little more than a month. “Design is what I am passionate about and wherever I am, I am constantly influenced and inspired by the interior designs out there. 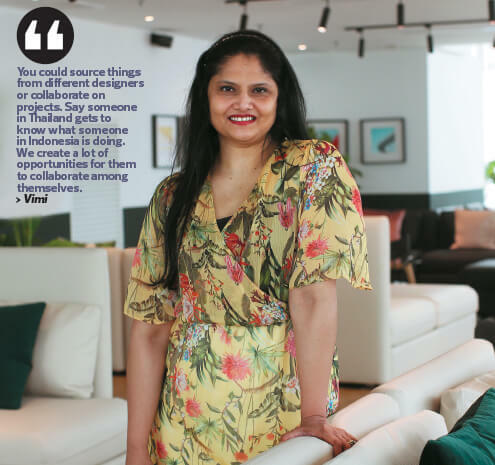 I wanted to create a platform where you could have everything to do with interior design in Malaysia, and also Asia, under one roof,” says Vimi. Vimi says Interiorati features the work of different designers — be it interior, furniture or lighting. And if people see something they like, there is usually a link that directs them to their websites. “If you are an interior, furniture or lighting designer, then we talk about what you do, the products you make and create a link to your online space,” she adds. At the time of the interview, it had been seven months since she embarked on the venture and the portal had only been live for 1½ months. “So, it is very early days yet. I am going out and speaking to all these people — designers and even homestores. I am speaking to the niche players and sharing the idea with them to see whether they want to come on board,” says Vimi. Her idea is to showcase what Malaysia has to offer. “Also Singapore, Indonesia, Thailand ... all these guys. I feel there is a lot within the creative industry here and we want to bring it all out and showcase these niche players to the world,” she says. Vimi wants to set them up alongside the more famous furniture makers of the world. “This is not to take anything away from Scandinavian furniture because I love that too. But I think they have their space and we hope to have a space for the Asian guys as well,” she says. She is going for classy and exclusive, but this does not necessarily mean expensive. “We are not saying high-end. We are saying high-end as well. It does not mean if you are not high-end, we don’t want you. If you are doing something really interesting and unique ... the price of the products is not the value here, it is essentially the design and what you bring to the industry,” she says. So, is she only going to feature Asian designers? “I don’t want to fit into that box. Is this about Asia? No. All the same, the focus is on Asia because I think they are the ones who have not had the chance to bring out what they have to offer to the rest of the world,” says Vimi. Basically, Interiorati is a community. “The community belongs to you and everybody else in the design industry. We are creating a space where not only the users but also the rest of the people in the industry can collaborate with one another and see what is out there,” she says. A new user has to create a profile to get connected to its website. “There is a link provided to all these websites. You create a profile for each of these guys. We have sections such as furniture designers, lighting designers, interior designers or stylists, home deco stores and artists,” says Vimi. At the time of the interview, only 20 designers had signed up. “It is a good starting point for us and it will grow from there. There are people who have contacted us saying that they have heard about it, but it has not translated into anything yet as we are still talking. It is still too early,” she says.